Fountaingate Gardens has been planned with many lifestyle-enhancing amenities in mind to help you live your most active, engaged and enjoyable retirement. From group aerobics classes and a dip in the heated, indoor saltwater pool, to a visit to the on-campus salon and spa, and to a delicious chef-prepared dinner in one of the three available dining locations, you’re bound to find endless enjoyment at Fountaingate Gardens. With so many amenities and services to take advantage of, you’ll need a haven to return to at the end of fulfilling days. The Lilac, our luxurious 2-bedroom, 1360 square foot apartment home located in the attractive and intimate Terrace buildings can be that haven. The Lilac, like all of our residence options, is fully customizable. From the selection of paint colors, flooring, cabinetry, appliances, fixtures and more, the Lilac will quickly go from being just an apartment home to becoming your new home. When you open the door of the Lilac, you walk into a modern kitchen with full-size, high quality appliances, and an open-concept living and dining area. These rooms are perfect for hosting an intimate dinner party, or for just having a night in with your favorite television show. During beautiful Long Island evenings, enjoy the sunset and breeze while relaxing on your private terrace. The master bedroom suite will be your place to wind down after the day, or to get energized in the morning. The room is complete with a walk-in closet, washer and dryer, and full bathroom just steps away for your comfort and convenience. On the other side of the residence, you will find a full bathroom next to the kitchen—ideal for hosting guests. If your guests have traveled long distances, the adjacent second bedroom makes a wonderful guest room. You could also use the extra bedroom as an office, art studio, library, hobby room, or simply as additional storage space. With the grand simplicity of the Lilac, and the ease of maintenance-free living, you’re sure to feel at home at Fountaingate Gardens. With less time dedicated to the cleaning and upkeep of your residence (since maintenance and housekeeping services are included), you’ll have more time to take advantage of the wonderful amenities and activities the community will offer. Take a class, go for a stroll on the walking paths that surround the beautiful grounds, make new friends by joining a club, or take advantage of our many excursion trips to nearby attractions; whatever a day in the life of your retirement may bring, you will feel good knowing that Fountaingate Gardens and the relaxed Lilac floor plan provides the perfect home for your active lifestyle. Reserve your Lilac floor plan today by placing a priority deposit at Fountaingate Gardens. You’ll be one step closer to living an active, amenity-rich retirement. 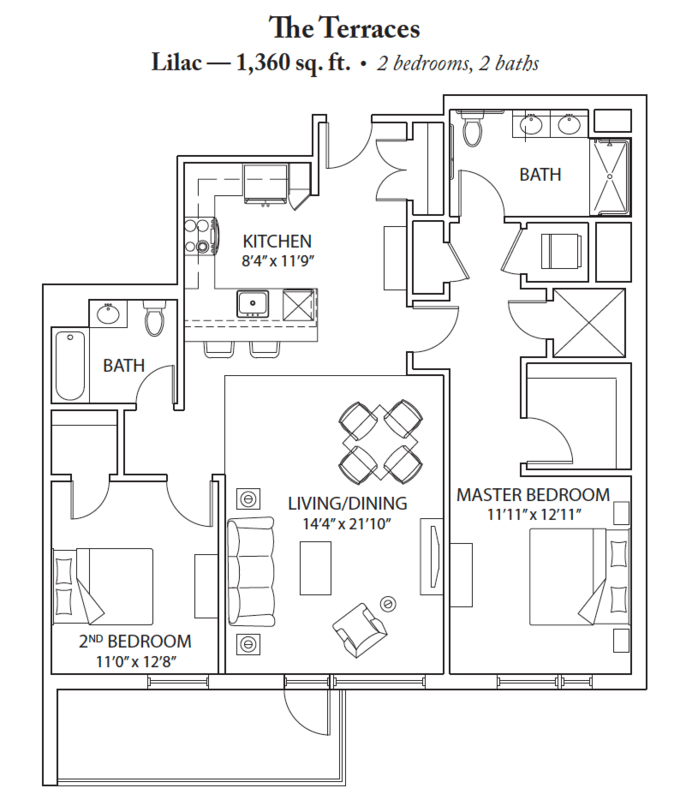 To learn more about the Lilac or one of the other many floor plans offered, give us a call today at 631-210-5806. New Rendering Released – Take a Peek at Fountaingate Gardens Dining!